Berlin is the queer capital of Europe and has been a pioneer of gay and lesbian rights since the late 19th century. On this Queer Berlin tour we will explore Berlin’s gay neighbourhood, Schöneberg, home of Marlene Dietrich and chronicled by Christopher Isherwood and Otto Dix. We will visit the Eldorado, one of Berlin’s oldest gay and transvestite bars, and frequented by openly gay Nazi SA leader Ernst Röhm. 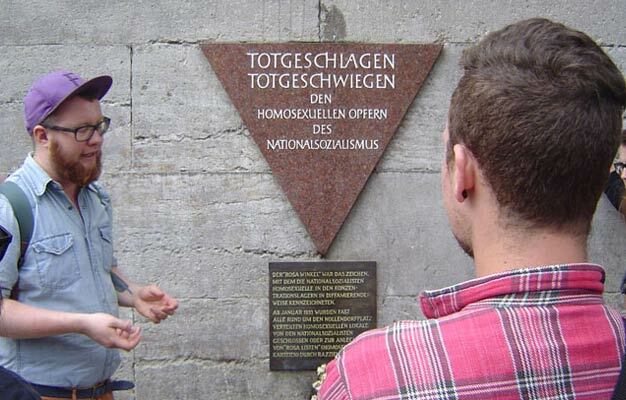 We also stop by the Memorial to the Homosexuals Persecuted under the National Socialist Regime and find out how openly queer and transgendered individuals found assistance from advocates such as Magnus Hirschfeld, whose Institute for Sexual Science was shut down in 1933, its library destroyed in the infamous Nazi book-burning. We'll walk through the Tiergarten, the city’s best-known gay meeting spot in the shadow of the Berlin Wall. Find out how queer figures from the Prussian King Frederick the Great to today’s openly gay mayor Klaus Wowereit have shaped the history of Berlin, a city which still believes a “kiss-in” to be the best form of protest. We'll end the tour at the Gay Museum in vibrant Kreuzberg. - The tour starts outside Starbucks at Hackescher Markt. Here you will find the guide from Original Berlin Walks. - As this tour incl. rides with the Berlin Subway, please bring an AB public day pass transport ticket or buy one from the guide. - Children under 12 years old are free, when accompanied by a paying adult. Youth price is for all under 26 years old. - The tour is on rain or shine, so please wear clothes and shoes that are weather appropriate. - Food and drinks are not included in the price. - The tour ends at the Gay Museum. - The Queer Berlin tour operates April through October on Fridays at 1.30 PM. Children under 12 years old are free, when accompanied by a paying adult. Youth price is for all under 26 years old. The tour operates April through October: Fridays at 1:30 PM. Food and drinks are not included in the price.